The concept of discounted cash flows (DCF) is introduced in Level 1 under the Quantitative methods study session. DCF builds on the notion of time value of money and also ties directly into corporate finance and project financing decisions. The basic premise is that when we value an asset what we are really doing is discounting the sum of its future cash flows. That is, an asset today is only worth some discounted value of what it can pay us in the future. On the CFA L1 exam, it's a lock that you will be solving various iterations of discounted cash flow problems. There are five major themes introduced in this level one reading that are likely to show up on the exam. To calculate NPV on your financial calculator you need to use the cash flow (CF) function. Every time you do this on the exam make sure to clear all previous cash flows work by pressing ([CF][2nd][CLR WORK]. The worst thing you can do is lose points on problems you know how to solve by being careless. Now that you're ready, start by entering all of the sequential cash flows. When you are done entering the cash flows, hit NPV and enter the interest rate for I=? The internal rate of return (IRR) is defined as the discount rate that makes the NPV of all cash flows from a period equal to zero. In other words it is the rate of return that makes the PV of a project’s benefit equal the present value of its costs. IRR is sort of a proxy for the rate of growth a project is supposed to generate. With IRR, the bigger the better! The steps for entering cash flows are identical to NPV problems. The only difference is that we now hit [IRR][CPT] to calculate the IRR (and of course we are not asked to input an external interest rate). 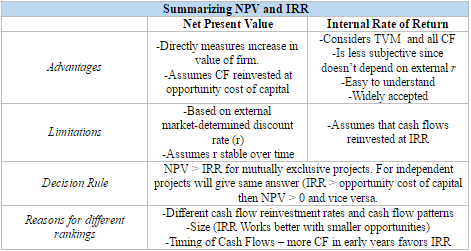 For a single project NPV and IRR will result in the same decision. Any project with a positive NPV will have an IRR > required rate of return and vice versa *(when NPV = 0, the IRR = the required rate of return). But when facing mutually exclusive projects, or projects with non-conventional cash flow patterns, NPV and IRR can give conflicting answers. This is a result of either different initial costs or uneven timing of cash flows. Just remember, the __sooner__ cash flows occur, the __higher__ an IRR will be __even if the ultimate NPV of that project ends up being lower. The time weighted rate of return (TWRR) is the compound growth rate in an account over a period of time. It measures the rate at which $1 compounds over time. So say we have a 30 day period with no cash flows followed by a 90 day period. We define r1 is the return in that 30 day period, r2 as the return in the 90 day period and so on. The money weighted rate of return (MWRR), or dollar-weighted return, is the IRR on all funds invested during a period. If you do have to calculate MWRR enter each cash flow into your calculator and CPT the IRR. TWRR is unaffected by external cash flows. It reflects what would have happened to our beginning value if no external cash flow had been present. This makes it more appropriate for evaluating a manager’s performance when that manager has no control over the timing of withdrawals and deposits into the fund. This is partly why it is the preferred standard for reporting. On the negative side, however, TWRR calculations are data-intensive and expensive. This is because it requires us to revalue the entire portfolio on the date of all external cash flows. In contrast, MWRR is affected by returns and timing of external cash flows. Thus the money weighted rate of return is only appropriate for performance evaluation of managers who control the timing of cash flows (or for periods of small cash flows). On the plus side, MWRR is cheaper to calculate because it only requires the beginning and ending value (and not the market value on the day of each cash flow). As you can imagine MWRR and TWRR are significantly different if there are large cash flows present. Be able to convert from one to the other and also know which yields the highest value. We've written a full post covering this here.